First a novel in 1932, then a Hollywood film the subsequent year, then a smash-hit Broadway musical in 1980, 42nd Street’s route from page to stage has been a long one. But there’s nothing drawn out about the West End opening of Mark Bramble’s new revival, which taps its way on to the Theatre Royal, Drury Lane stage – its original London home – with an all-singing, all-dancing cast of nearly 50. Bramble, who co-wrote the original book with Michael Stewart, has directed revivals of 42nd Street across the world, including another long-running, Tony Award-winning Broadway production in 2001. His cast this time includes Grammy-award winning singer/actress Sheena Easton, making her West End debut in this, the ultimate backstage fairytale. The story revolves around Clare Halse’s Peggy, a humble chorus girl, unexpectedly thrown into the limelight when the star of a New York-bound musical breaks her ankle and its dictatorial director has no-one else to turn to. 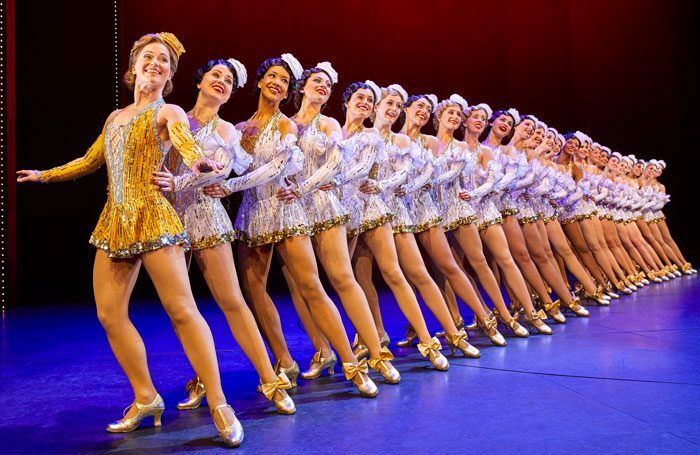 Set during the Great Depression, stuffed full of Al Dubin and Harry Warren classics, and boasting tap dancing galore, 42nd Street is an unapologetic paean to the lure of the Great White Way. Even the Duchess of Cambridge couldn’t resist it. Does Bramble’s revival win over the West End or is it a right royal flop? Did the critics leave tapping their toes or shaking their heads? An American in Paris recently blew the critics away with its enchanting evocation of Paris. Can Bramble’s creative team – Randy Skinner’s choreography, Douglas W Schmidt’s set, and Roger Kirk’s costumes – do the same for 1930s American theatre? Some are hooked from the off, swept up by an iconic opening image. “There are few more famous openings in musical theatre,” explains Tim Bano (The Stage, ★★★★★), who goes on to heap praise on Bramble’s revival as “a blunt force trauma of a show”, “full of the sound and fury of tapping feet, illuminated by dazzling colour”. “You get everything but the kitchen sink,” chimes Sarah Crompton (What’sOnStage, ★★★★), “dancing flowers, Busby Berkeley beauties reflected in a gigantic overhead mirror, high-kicking chorines, and finally, blissfully, a golden-lit stairway to heaven with everyone singing and hoofing away as if their lives depended on it”. And such praise is matched all round. Dominic Cavendish (Telegraph, ★★★★★) “loved it in the way one can’t help loving achingly beautiful things”, while Alice Saville (Time Out, ★★★★) got lost in “kaleidoscopic dance routines that resemble the hallucinations you might get after drinking absinthe in a Tiffany showroom”. “Through each familiar and hummable tune (We’re in the Money, Lullaby of Broadway, Keep Young and Beautiful),” concludes Tony Peters (Radio Times, ★★★★★), “the pizzazz of Roger Kirk’s costumes and Randy Skinner’s choreography increases a notch until the big finish on the title song: a display of perfectly timed dance by the 50-strong company that takes the breath away”. 42nd Street – All brawn, no brains? It’s a knockout on looks then, but does 42nd Street have the emotional drive to back up its dazzling display of dancing? Michael Billington (Guardian, ★★★) thinks not. “The energy displayed is remarkable, but there comes a point when one craves a little humanity,” he complains. “There is something curiously heartless about this revival of a musical first seen on Broadway in 1980. In all honesty, I’ve been more moved by a military tattoo”. Others pick up on this paucity of passion too. “The characters are wafer-thin, the plot hokey and we simply don’t care whether ‘legendary’ (apparently) director Julian Marsh’s latest extravaganza will make it on the Big White Way,” writes Fiona Mountford (Evening Standard, ★★★). “It’s even hard to be over-bothered about the fate of chorus girl Peggy Sawyer, so little back-story is she given”. For some critics, however, this hollowness just isn’t a problem. “No one goes to 42nd Street for Shakespearean depth of emotional expression,” opines Crompton. “What you go for is an endless catalogue of catchy songs from Lullaby of Broadway to Shuffle Off to Buffalo and tap routines so vigorous they make your fillings rattle”. “Don’t look for characterisation or depth, or even a book that makes much sense,” agrees Matt Wolf (The Arts Desk, ★★★★). “The point here isn’t individual revelation but, instead, the rarely-encountered sight and sound of a mercilessly drilled ensemble all but knocking themselves out to deliver the goods”. But there’s another problem: Dubin’s lyrics, which strike some 2017 ears as anachronistic, to say the least. Or, as Cavendish puts it, “give them a nudge, and doubtless the equality brigade could be up in arms about the female objectification”. “In this day and age, it is astonishing to hear the chorus sing, in Keep Young and Beautiful, “What’s cute about a little cutie is her beauty, not brains”,” writes Billington, and Saville agrees. “I could have done without retro-sexism fiesta Keep Young and Beautiful being shoehorned in there,” she writes. “The whippet-thin, perma-grinning chorus make that point without needing to shout about it”. As Karl O’Doherty (Reviews Hub, ★★★★) notes, “it’s a show to remember and a memory to cherish, just be sure to recognise it’s not something to set your moral clock by”. Sheena Easton is Dorothy Brock, the unfortunate star who’s injury gives Clare Halse’s Peggy her big break. Alongside them is Tom Lister, who’s musical director gets to deliver the show’s most famous line: “Sawyer, you’re going out a youngster but you’ve got to come back a star!” How do these three principals fare? “When the character’s dancing is praised to the high heavens, the actress must deliver,” observes Marianka Swain (Broadway World, ★★★★), “and Halse certainly does: her taps are crisp, bright and beautifully articulated, each one clear as a bell”. 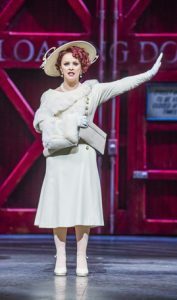 “Sheena Easton, making her West End debut, needs to loosen up a bit in the role of Dorothy,” reckons Peters, “but there are no question marks over her voice when she displays a terrific range on a series of solos and duets, including the dramatic Boulevard of Broken Dreams”. Crompton agrees, labelling Easton’s performance “game but entirely wooden”. “She is a singer, not an actress,” Crompton notes, “and she finds emotion only when her still lovely voice floods out”. And Lister? It’s difficult to say, his performance being variously described as “convincing” by Swain, “commanding” by Peters, “rather out of his depth” by Saville, and lacking “the menace that Jerry Orbach brought to the role on Broadway”, by Billington. In truth, though, these leads don’t get much of a look-in in the reviews, which devote the bulk of their applause to the slick, synchronised, splendid ensemble. “The garlands belong to the ensemble, dancing on the spot as if gliding on ice, wind-milling arms furiously yet gracefully,” concludes Cavendish. 42nd Street – Is it any good? It’s beautiful to look at, everyone agrees, but for some, the flimsy plot, weak characterisation, and out-dated lyrics prevent it from delivering a knock-out blow. Halse, Easton and Lister supply adept leading performances, but they’re outshone by the army of tap-dancing hoofers behind them. 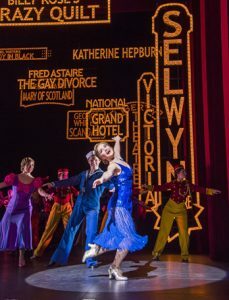 Like An American in Paris before it, 42nd Street is a slice of classic Broadway glamour; it’s just swapped the balletic grace of France for the high-kickin’, toe-tappin’, all-out razzle-dazzle of the Great White Way. Love it or loathe it, you can’t disagree: they really don’t make ’em like this anymore.